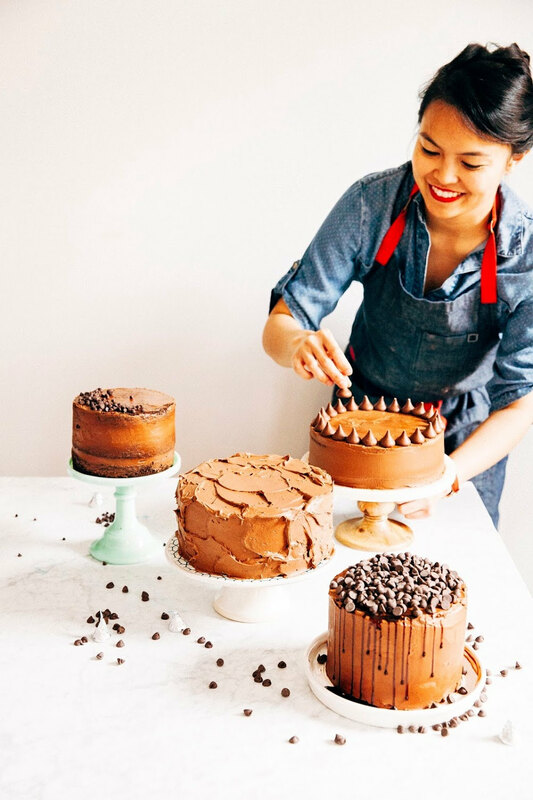 If you pay attention to the food world, you'll know that there's this pie shop in Brooklyn called Four & Twenty Blackbirds that's been making the waves right now. Their recently released cookbook is much beloved, with Food52 even dedicating a whole week to Four & Twenty Blackbirds' pie recipes. So naturally, I had placed the pie shop at the top of my list of things to visit while I was in New York for Christmas. In fact, I had talked up Four & Twenty Blackbirds so much that even my boyfriend's parents were interested in tagging along and trying out some pie with us! This is a big deal — Erlend's dad doesn't have much of a sweet tooth, yet he was still won over by the idea of their pies. The four of us sat down and pored through Four & Twenty Blackbird's winter pie menu, strategizing who was going to get what. We debated and fought over flavors like Salted Caramel Apple, Grapefruit Custard, and Lemon Chess for a good 15 minutes. So off the four of us went, taking the subway from their apartment in Morningside Heights all the way to Four & Twenty Blackbirds' location in Gowanus, Brooklyn. I'll admit that I'm not the most familiar with Brooklyn — although I have good friends that have resided/currently reside there, they've all tended to cluster in hip neighborhoods like Williamsburg or Bushwick. I assumed that Gowanus would be the same since the only landmarks I knew to be in the area were this pie shop and a terrarium store. But more on that later. To our horror, Four & Twenty Blackbirds didn't look any different from the sorry storefronts that we had just passed. It was empty and lifeless, with bars on the windows and a boarded up door. Did we miss something? Apparently we did — Erlend's dad spotted a tiny sign explaining that Four & Twenty Blackbirds was taking a holiday break. A crucial fact they had neglected to announce on their website. This pie is adapted from Four & Twenty Blackbirds' recipe for Lemon Chess pie. What is chess pie? A pie filled with creamy custard. Sometimes flavored with fruit (like ours, in this case), but often times just plain old buttermilk or vanilla custard. I've heard two different origin stories for the chess pie. According to Wikipedia, it was named for the pie chest that predated the modern refrigerator and was used for storing pies and other food. 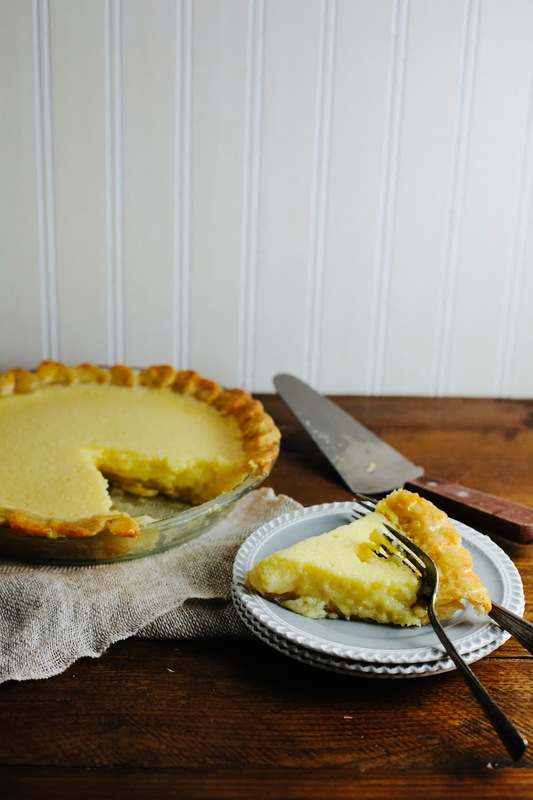 According to Christina Tosi, head pastry chef of Momofuku Milk Bar, chess pie is a spin off of the expression "just pie" — often used by the ladies of yesteryear to describe winter pies they would make that lacked fruit filling ("just pie"/"chess pie"... get it?) since nothing was in season. I'm sure the real story is somewhere between the two, but I like Christina's a lot more so I'm sticking with hers. 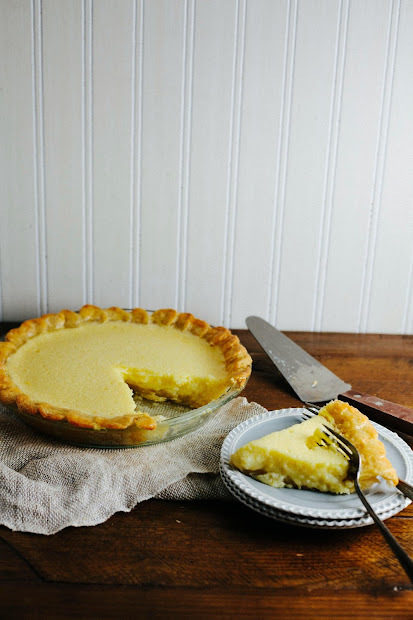 For this pie, I substituted regular lemons with Meyer lemons, which I think gave the pie a slightly sweeter custard — truth be told, this tasted like a lemon bar in pie form! Its sweetness was offset by the apple cider vinegar in the pie crust recipe, which gives the pie crust a slightly tang along with a unique tender texture. As I've admitted several times on this blog, I've never been great with pie crust, so please forgive the uneven edges. I'm sure it would have been better at Four & Twenty Blackbirds... not that I'll ever know. Four & Twenty Blackbirds uses an all-butter pie crust recipe, which means that it's extremely hard to work with. Make sure you chill and allow the pie crust to rest for the exact times specified in the recipe, or you'll find your dough sticking to EVERY DAMN THING. The best advice I can give is to a) work in a cold room (not a problem considering the cold front that's eaten up most of the country at the moment), b) wash your hands with cold water constantly as you work, c) invest in a marble rolling pin to chill in the freezer for 5 minutes before you start rolling out the dough and d) believe in yourself. 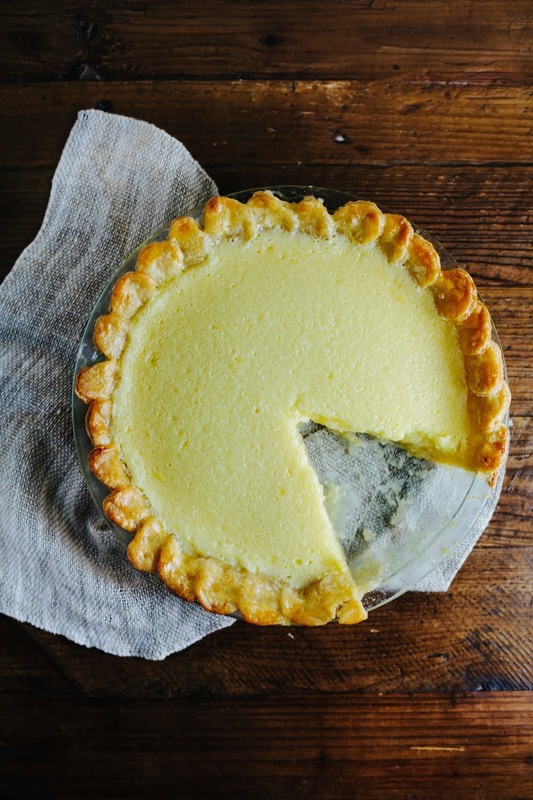 When baking a custard or cream pie, you often need to prebake the pie in order to ensure that the pie crust gets baked completely. This is called blind baking. The pie shell is lined with foil and baked with a heat-conducive material in the center (pie weights or beans) for 20 minutes or so, before it is baked again with the cream filling in the middle. Blind baking results in a crisp, flaky crust that contrasts with the creamy custard filling. Let's talk about crust, baby. To get the scalloped crust that I did (and I'm sure your version will be much prettier than mine), you will need to double the pie crust recipe. Treat it the same way you would treat the dough for the pie shell until after you roll it out — instead of folding the dough to transfer it to to the pie plate, stamp out circles using a small cookie cutter or a shot glass. Brush the edge of the crust with water, and lay the circles around the edge, overlapping each. Any shape can be used, just remember to keep the dough pieces small — pieces that are too large are more likely to become misshapen in the oven as demonstrated in my pie. It's also best to overlap the circles as much as possible, since they are less likely to sag and become misshapen during the baking process. Prepare 1/2 cup cold unsalted butter by cutting it into 1-inch cubes. Place cubes in a small bowl and cover with plastic wrap before sticking in the coldest part of your freezer for 10 minutes. In a large bowl, combine 1 1/4 cup all-purpose flour, 1 1/2 teaspoons granulated sugar and 1/2 teaspoon kosher salt. Add the frozen butter cubes (from the 1st step) and coat with the flour mixture using a rubber spatula. 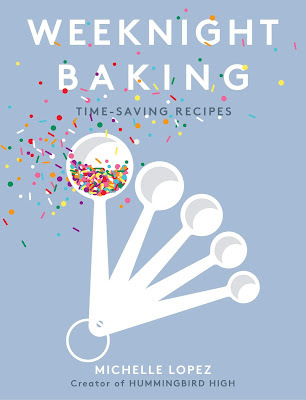 Use a pastry blender to cut the butter into the flour mixture, working quickly until mostly pea-size pieces of butter remain — a few larger pieces are okay, but be careful not to over blend. Combine 1/2 cup water, 1/2 cup ice and 2 tablespoons apple cider vinegar in a liquid measuring measuring cup. Sprinkle 2 tablespoons of the ice water mixture over the flour mixture, stirring the water into the mixture with a rubber spatula until it is fully incorporated. Add more of the ice water mixture, 1 to 2 tablespoons at a time, using the rubber spatula to mix until the dough comes together in a ball, with some dry bits remaining — be careful not to use too much water, or the bottom of your pie will be soggy. Use your fingertips to squeeze and pinch bring all the dough together to combine. Use a couple drops of water here and there, but be careful not to use too much. Shape the dough into a flat disc, wrap in plastic, and refrigerate for at least 1 hour, but preferably overnight. Wrapped tightly, the dough can be refrigerated for 3 days or frozen for 1 month. When your dough has rested and chilled (for at least an hour, preferably overnight), it should have the consistency of saltwater taffy. The dough is then ready to be rolled. Liberally sprinkle a work surface with flour — I used around 1/4 cup's worth. Unwrap the dough and place it on the work surface, sprinkling its top with flour. If the dough is too hard, let it rest for a few more minutes. If the dough seems too sticky, place it back in the fridge to chill for another hour or so. Use a rolling pin to roll with light pressure, from the center out to create a circle. Roll the dough about 10 inches in diameter and about 1/4 inch thick — you can place your pie plate upside down over the rolled out dough to see if the dough is big enough. Move the dough onto the pie plate by placing a piece of wax or parchment paper over the rolled out dough, and folding it in half, before placing another piece of parchment paper over the half and folding it into quarters. Move the folded up dough onto the plate and unfold it. When the dough is in the plate, press it firmly into the bottom and sides of the pan. Cover with plastic wrap and transfer to the refrigerator to rest for another 30 minutes. 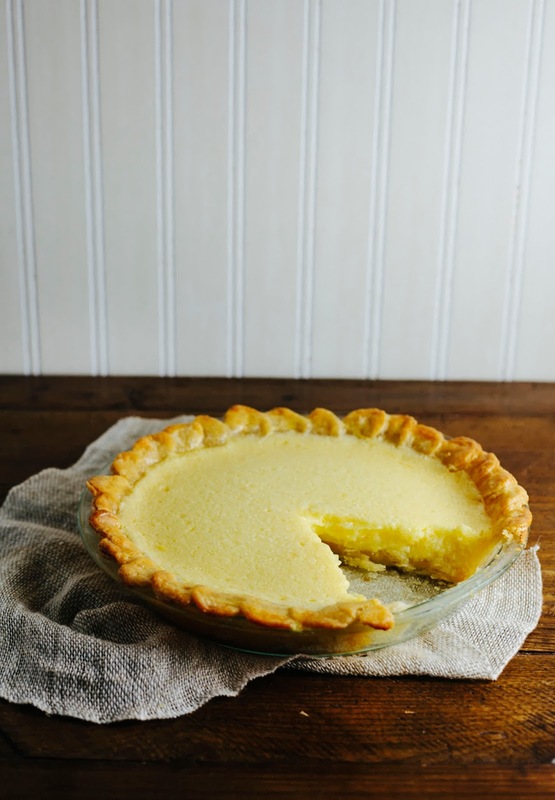 Once the pie shell is fully chilled, use a fork to prick the bottom and sides of the shell – these holes help eliminate the air bubbles that can form when the dough is exposed to heat and helps prevent the shell from shrinking. Place crust in the freezer to freeze for another 10 minutes. While the crust is freezing, preheat the oven to 425 (F) and position the oven racks in the bottom and center positions of the oven. Place a rimmed baking sheet on the lowest rack. When the crust is frozen, line it tightly with a piece of aluminum foil. If creating scalloped edges (see baker's notes), make sure the scallops are completely covered and there are no gaps between the foil and crust. Pour the pie weights into the pie over the aluminum foil, making sure to spread them so they are more concentrated around the edge of the shell than the center. Place the pan on the preheated baking sheet on the lowest rack and bake for 20 minutes, until the edges of the pie are set but not browned. Remove the pan and the baking sheet from the oven, but keep the oven on. Lift out the foil and pie weights. Allow the crust to cool for 1 minute. While the crust is cooling, make an egg wash by whisking together 1 large egg white and 1 teaspoon of water. Use a pastry brush to coat the bottom and sides with a thin layer of egg wash to moisture-proof the crust. Return the pie pan to the baking sheet and place in the oven's center rack, baking for 3 more minutes. Remove and cool completely on a wire rack before filling. Position a rack in the center of the oven and preheat the oven to 325 (F). Place the prebaked pie shell on a rimmed baking sheet. Use a heatproof rubber spatula to stir in 5 tablespoons melted unsalted butter, then 5 eggs, adding the next egg only after the one before it has been fully incorporated into the mixture. Once all the eggs are added, whisk briskly until the filling is thick and light colored. Stir in 2/3 cups heavy cream, followed by 7 tablespoons Meyer lemon juice, 3 tablespoons orange juice, and 1/2 vanilla extract. Strain the filling through a fine-mesh sieve directly into the pie shell. Bake on the middle rack of the oven for 40 to 50 minutes, rotating 180 degrees when the edges start to set, 30 to 35 minutes through baking. The pie is finished when the edges are set and puffed slightly and the center is no longer liquid but still wobbles slightly; it should be lightly golden on top. Be careful not to overbake or the custard can separate; the filling will continue to cook and set as it cools. Allow to cool completely on a wire rack, 3 to 4 hours. Slice and serve. The pie will keep refrigerated for 2 days or at room temperature for 1 day. So... are you going to make all the other pies too? I assume Lemon Chess you were the one arguing for? And you're right--- I don't understand why places don't pay attention to their websites as it's one of the main communication mechanisms to customers of location and hours. It takes what, how long to even add the updated line to the page? During holidays I found myself never trusting the website and also googling to check their FB and Twitters, sadly. It saved me a couple times from disappointment like you had, but I shouldn't have to do that! Ugh, checking social media was the smart thing to do... unfortunately, I did not do that. Oh my gosh...your story is so CRUSHING! This has totally happened to me when traveling and it is absolutely heartbreaking when you know you can't just try back next week. Shame on them for not posting it on their site! But I'm definitely going to try your version of there recipe next time I need to make a pie! P.S. After some significant experimenting, I perfected my Lemon Meringue Pie last year - something I'm pretty excited about! If the timing works out, I'm planning to enter it in the 3rd Annual Pacific Pie Bake-Off on January 19th. Are you planning to go? Unfortunately, I won't be in town that day, so I won't be entering the competition! Pies have never been my strength though (I'm better at cakes), so I probably won't be missed. Good luck! Let me know how it is. That is one impressive pie, Michelle---the pale yellow color is stunning. THAT IS THE MOST DISAPPOINTING THING. UGH. I am a little grumpy on your behalf. But yay for turning closed stores into lemon pie! I happen to think it looks beautiful. Did Erland's fam get to try it?? Oh man, there's nothing worse than getting yourself all psyched up for a major foodie experience only to to have your plans fall apart. I think recreating one of their pies was the only thing to do - this looks so good. I love your scalloped edges too, so pretty!